Oct. 15, 2002 - The Pro Football Hall of Fame and Pro Football Hall of Fame Festival today announced a number of significant changes to the 2003 Hall of Fame Enshrinement and Festival activities schedule. While the majority of changes will most affect the traditional Friday through Monday Hall of Fame weekend schedule, there will also be some modification to the calendar of events during the entire 11-day Festival period. 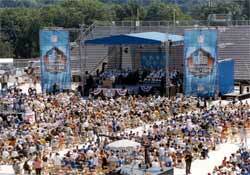 A record crowd attended the 2002 enshrinement ceremony at Pro Football Hall of Fame Field at Fawcett Stadium. The most significant change will be the moving of the Enshrinement ceremony from Saturday afternoon to Sunday afternoon. Also, as part of the timetable restructuring, the Enshrinees Civic Dinner will be moved from Friday evening to Saturday evening. The Mayor's Breakfast will be eliminated and a greater focus will be placed on Monday's Enshrinees GameDay Luncheon, which will be renamed and have a new and more vibrant look. The Sunday team practice sessions also will no longer be offered as part of the weekend schedule. These moves are intended to help the Hall of Fame, the Festival, and the City of Canton condense the now four-day weekend schedule of events into a stronger, more dynamic three-day schedule. The three-day Hall of Fame Weekend will now begin with the Hoover Company Grand Parade on Saturday morning and conclude on Monday night with the annual AFC-NFC Hall of Fame Game. "Hall of Fame officials believe that in addition to a stronger overall event schedule, these changes will ease schedule conflicts and reduce by one the number of days new enshrinees and returning Hall of Famers need to set aside in order to participate in the multi-day celebration," stated John Bankert, Executive Director of the Pro Football Hall of Fame. "We believe the Sunday-Monday format of the Enshrinement and Hall of Fame Game will provide a better opportunity for out-of-town guests to attend both events," he concluded. Other changes in the Festival schedule were the outgrowth of recently concluded intensive long-range planning sessions spearheaded by Dr. William Bittle, Dean of Kent State University Stark Campus and the 2003 Festival General Chairman. The goal of the sessions was to determine ways to create an even stronger and more successful Festival for the future. Changes include the relocation of the annual Ribs Burnoff to the more spacious Stark County Fairgrounds, with the event beginning on Wednesday rather than Tuesday, as in more recent years, thus significantly reducing the City's financial burden. In addition, the Drum Corps Competition will be held one week earlier, on what formerly was called Kickoff Sunday. The traditional Kickoff Sunday concert will be shifted to a location in downtown Canton and will be held one week later, on the Sunday night of Hall of Fame Weekend, concluding with a giant fireworks show. All of these changes are subject to the ability to finalize the massive details in planning the events, but the general format has received the full support and approval of the Board of Trustees of the Pro Football Hall of Fame, as well as the Festival Steering Committee and the Board of Directors of the Canton Regional Chamber of Commerce. There will be several event name changes to more accurately depict the true nature of the events, and every Festival committee is being challenged to take a fresh look at how they can enhance and grow their event, resulting in an even more fantastic slate of Festival activities. "The continued enthusiasm and commitment by a team of more than 3,500 community volunteers, working cooperatively with the staffs of the Hall of Fame and the Festival, will be crucial to the implementation of these changes, and we are confident everyone will meet the challenge," noted Joanne Murray, Festival Director. Additional information and specific event times will be announced as the schedule is finalized.